Shopping for Space 1999 Model Kits? The Alien Moon Buggy from the TV show Space: 1999! Paint and glue required, not included. Includes in-scale figure and updated decals! 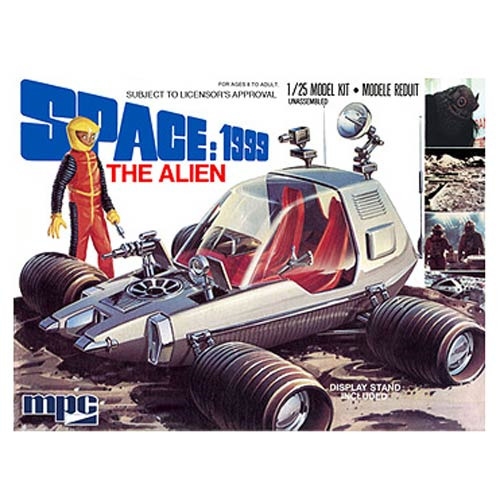 In 1:25 scale, it's The Alien Moon Buggy from the TV series Space: 1999! The TV show, which originally aired in 1975, featured the crew of Moon Base Alpha as they found themselves stranded on our moon as a nuclear disaster knocked it from Earth's atmosphere. This fun moon buggy, known as The Alien features tons of detailed parts such as weapons, antennae, and suspension. It features the retro future styling of the 1970s including bucket seats. The car includes an in-scale figure in an accurate Space: 1999 space suit. The Space 1999 The Alien Moon Buggy 1:25 Scale Model Kit also includes a vacuform base featuring moon surface detail. Updated decals are included. Paint and glue are required for assembly, not included. Recommended for ages 10 and up with a skill level of 2.